The official neighbourhood plan is a BIG thing for our neighbourhood and something that we have been advocating for over the past several years. The decision to proceed reflects our long worked for standing and respect with the city and provides us with a real opportunity to shape the long term future of the neighbourhood. Aside from the detailed planning involved it also has the potential to strengthen our relationship with city hall and influence the processes that impact us. The plan will likely take about a year and will involve a fair bit of work. Hopefully you will all be interested in the process and helping out where possible. We will be voting in our new board at the AGM on December 3. Anyone interested in standing please let me know in advance (250 754 0677) and I’ll get you on the ballot. A reminder that anyone standing for office or wishing to vote needs to be a resident of the south end and a member in good standing of SECA for the three months prior to the AGM. My best wishes for all of you as we head into the holiday season! A Neighbourhood Plan for the South End! Finally it’s a reality. SECA has long been advocating for an official neighbourhood plan and Wednesday, November 19 marked the beginning of an exciting and important chapter for our neighbourhood. The SECA executive met with representatives from the City Planning Department to begin discussions about how the process will unfold over the next year. The purpose of the neighbourhood plan is to provide residents and businesses with an opportunity to shape the way that we want to see out neighbourhood develop in the future. The plan deals with all kinds of land use issues, park and recreation amenities and any other important issues that we believe impacts our neighbourhood now and in the future. The goal is to involve as many people as possible in the process so that everyone gets to contribute to the plan. To that end the Steering Committee in conjunction with various city planners will be hosting a series of open houses and workshops with a goal of inviting participation and informing the neighbourhood about the plan’s progress and development. The planning process is a collaboration between residents and city officials who will guide the process, provide various resources, and ensure that the plan develops in a way that is consistent with the principles outlined in the Official Community Plan. ways that we can address the social issues that are such a concern to all of us. Change is a slow and difficult process but it starts with a vision of where we want to go, an appreciation for our many strengths and resources and a determination to see it through to fruition. Watch this space for more details! We’ll fan out around 9:30 to clean up for an hour and then deposit our litter in MGM’s bin (thanks Tony and Katrina). Bring gloves and extra plastic grocery bags. By 10:30, you’re on your way, and may even have burned off the calories from breakfast! On April 4 2009, thousands of people throughout B.C. will march to demand that the government in Victoria build enough affordable rental housing to meet urgent B.C. needs. Together we can make affordable housing a key issue in the election. The goal of these marches is to elicit immediate, concrete public commitments from provincial candidates seeking election on May 12th. During the past six months the province-wide Stands for Housing movement has grown in strength. Our accomplishments include increasing alliances among community organizations, 75 Stands on one day and attention-getting Surround City Hall events last month. Because there have been Stands with close to 100 participants, including 70 in the small municipality of Princeton, we know that recruiting large numbers of people is achievable. This well-known annual event, which ensures that needy children up to age 17 will receive a gift at Christmas, is up and running for 2008. Registration happens at Harewood Mall (next to Starbucks) on December 1, 2 and 3 from 10 AM to 4 PM. To register a child, please bring your care card. Receiving Days are December 17 and 18, between 9 and 4 PM at the Franklyn Street Gym (rear). Parents come and select a gift from the display that they think their child would like. If you would like to donate, the drive is looking for new toys that have not been wrapped in Christmas wrapping paper. Toys are sought for all children, from newborns to teenagers. This is a huge community effort and over 100 volunteers are needed. If you can help sort before or distribute at the event, please contact Arlene Brownhill at 758.8670. At the Filling Station (the former Jolly Miner), Friday November 28 between 6 and 9 PM. Tickets are $10.00 each. It’s not a big place, and tickets are selling quickly, so if you want to come for sure, call and get your ticket in advance. If you can help us out with a donation, we’d be eternally grateful. Don’t limit yourself to the ordinary…at last month’s SECA meeting, the wish list extended from Christmas gifts to all kinds of services and even practical items like loads of gravel. If you don’t have a business, consider something that no longer has personal value, like that wedding gift from your ex-mother-in-law. Consider offering a dinner party for 4 or 6 people. You’ll be able to brag that people are willing to PAY for your cooking. You can drop donations off until Wednesday afternoon (Nov 26) at Sandra’s Head-to-Toe Salon, 721 Haliburton Street. For tickets or more information, please call Sandra Zuccolini at Sandra’s Head-to-Toe Salon 753-1394 or Moni Murray at the Nanaimo International Hostel 753-1188. What a fun day we had on Saturday November 8! 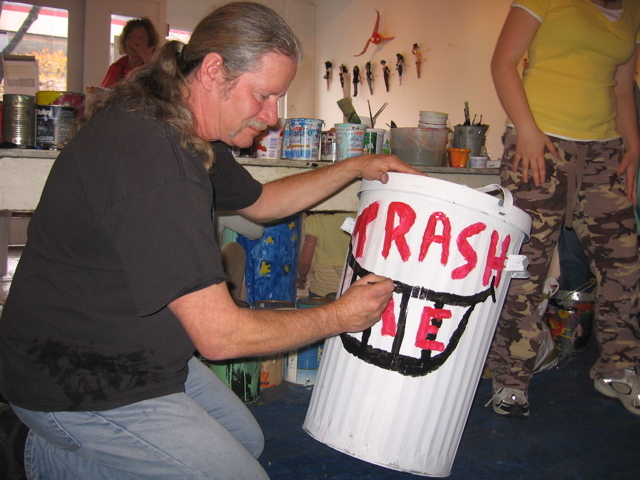 About 50 people turned up over the course of the day to release their inner artist. Click here for a great review of the day from one of our painters, along with some wonderful photos. We also got a nice article in the News Bulletin. We’re just in the process of determining where the painted bins will go. If you would like more information about or are interested in fostering a bin, please call Sandra Zuccolini at 753-1394. 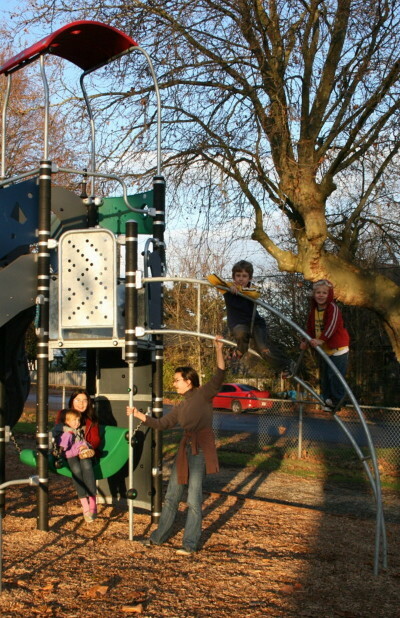 …safety surfacing for the playground [was] installed Thursday November 13. The playground [was] open for play right after that. We will be back in the park early 2009 to install the spray park and trike trail. The idea of planting the tree and creating a neighbourhood node of information at the road closure at Irwin and Milton is doable. We can’t do [a] bench (we no longer have a memorial bench program) but certainly trees, art, and a bulletin board are possibilities. Engineering is planning utility upgrades along Irwin for 2009 and the node at the road closure and accessible parking for the park along Irwin will be completed then. So, it would not be an immediate opportunity, but certainly one for next spring or fall.